I was recently graced with the honor of writing the quote for the back of the new artbook by the amazing Monsieur Z (site, blog). Which was a great pleasure as I'm a big fan of his work (you should be too). He even drew a hilarious caricature of me to go with the quote. I'll post it if I can get his permission. The website DigiBiDi recently added a 17 page preview of Matt Peters and my own Rex Steele: Nazi Smasher book. As far as I can tell DigiBiDi is a site specifically dedicated for previews of Comics, Graphic Novels, Mangas and BD naturally. Or at least that's what I assume, not being able to read french and all. Lastly I'd like to plug my good friend Robert Smith aka "the Iguana". Rob and I went to comic book school together and we learned much from each other. He works in the New York animation industry and has inked a bunch of Kids Next Door comics for DC. He's in desperate need of a blog, if you know him try to convince him would you? 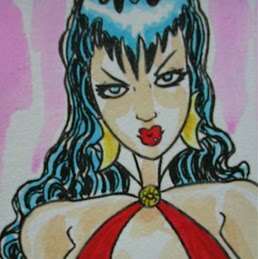 He does however sell some really cute (and sometimes naughty) girly art on Ebay for way to cheap.